Light and temperature are the defining needs of many succulents. In general, most need a great deal of bright light, although some take part shade. Most cannot survive for more than a night with temperatures below 40 degrees F, but some are hardy in all climates. Looking on the bright side (so to speak), the range of preferences means that there are succulents for every garden taste and climate. Provide as much light as possible during the summer — although full sun in really warm places, including their desert homelands, can be too hot for many succulents in the confines of a container. Some types prefer part shade. Protect succulents from cold weather in the winter. Move them indoors to a sunny window where temperatures do not drop below 40 degrees F.
If you have large heavy containers, plan to put them on wheels unless you want to start building your muscles. Succulents lend themselves to terracotta pots — the attraction’s probably the desert look about both plants and the containers. Terracotta also is porous, which keeps roots from sitting in water; stone and concrete pots also work well for the same reason. Making sure that the container has drainage holes is another important rule — sometimes so obvious it may be missed. Feel free to use a shallow container (just 4 to 6 inches deep) if it looks best for your plants — succulent roots don’t go very deep. For a plant with a rounded shape, choose a container that’s 2 inches wider than the plant. For an upright plant, choose a pot that’s half the diameter of the plant’s height. When gardeners select containers, cactus and succulents sometimes bring out the eccentric. You can plant small hens and chicks or other rosette-forming succulents in strawberry jars, old boots, or even worn-out tennis shoes. Another popular choice is hypertufa — a do-it-yourself project made with concrete, peat moss, and the mold of your choice. Hypertufa’s rugged beauty provides an appropriate setting for ornamental succulents like sedum, echeveria, and sempervivum. Quick drainage is the most important quality of a soil mix designed for succulents. The standard mix consists of one-half organic matter (peat moss, leaf mold, or something like that) and one-half grit (crushed rock or sand). You can find many cactus and succulent mixes already bagged. Design your succulent containers following the same principles that you apply for other plants: combining something tall and spiky, something mounded, something trailing. A well-balanced landscape can be accomplished by using one large container with several plants. Or put each plant in its own container and then group the pots — this mix-and-match method gives you freedom to rearrange on a whim. 1. First, cover the drain hole with a piece of broken pottery or a bit of metal screen. 2. Fill the container part way with soil mix and ease the plant into the container. 3. Use a narrow trowel or spoon to fill around the cactus with soil mix. Most cactus and many other succulents have shallow roots, so do not plant too deeply. Burying part of the stem invites rot to set in. Make sure that the soil level in the pot is no higher than the level of the soil in the plant’s nursery container. 4. After planting, add a top layer of gravel or crushed stone to provide a finished, desert-like look that also helps keep the base of the plant dry. Buy any bag of gravel you like or choose crushed rock that enhances the look of the plant and the container — something with a pinkish tone, for example, may look nice with terracotta. Feel free to add any decorative details at this point — miniature dry steer heads, thirst-craved miners, and so on. Forget some of the myths that you may have heard or imagined about cactus and succulents. You do need to water them and feed them. Water regularly during the growing season — remember that this can be winter for some species. Thorough watering is better than a sprinkle every day or two. When the soil is completely dry, it’s time to water again. One effective way to water smaller pots is to sit them in a tub of water nearly up to their rims, leaving them there until the top layer of soil is moist. During their dormant season and in cool temperatures (50 degrees F), most cactus and succulents can go without water for weeks at a time. Don’t become complacent and forget that the poor things are even alive. Resume regular watering just before the growing season begins. When plants are in a growing stage, fertilize about once a month — or every other time you water, if you water every two weeks. Succulents need all the nutrients that other plants do — nitrogen, phosphorus, and potassium — plus trace elements. You can use just about any complete liquid fertilizer or a special fertilizer designed for cactus and succulents; or try a tomato fertilizer at half-strength. 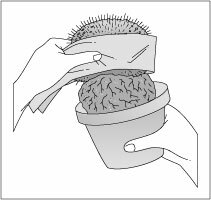 If you need to repot a cactus, use a piece of rolled-up paper towel or newspaper to remove the plant from its original container, as shown in Figure 1. Figure 1: Use a rolled up paper towel or newspaper to remove a cactus from its container.